Creativity for Kids Hide & Seek Rock Painting Kit is a new twist on our favorite 2007 Deluxe Rock-a-Doodle Kit. It’s weather resistant and perfect for you, your friends and family to paint rocks to hide outdoors to spread kindness, encouragement and happiness throughout your community – one rock at a time! This rock painting kit for kids gives you everything you need to paint, decorate and hide 10 rocks! 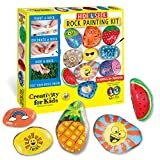 The hide and seek rock painting kit includes 10 natural River rocks, weather resistant paint (8 colors) and waterproof transfer designs (similar to temporary tattoos), tracking stickers, 2 paint brushes, transfer sponge and instructions. Hide your painted rocks throughout your community and post them online for your friends to view!